For people with severe hand shaking (tremor), it is impossible to operate a computer with the mouse or a tablet via touchscreen. CSS has developed an adapter which compensates a strong tremor of the hands electronically and which can be easily used. Millions of people worldwide suffer from a tremor, the strong shaking of the hands. Causes may be among others a Parkinson’s disease or, often age-related, an essential tremor. This symptom can be a significant constraint, particularly when operating a computer or modern tablets via touchscreen. 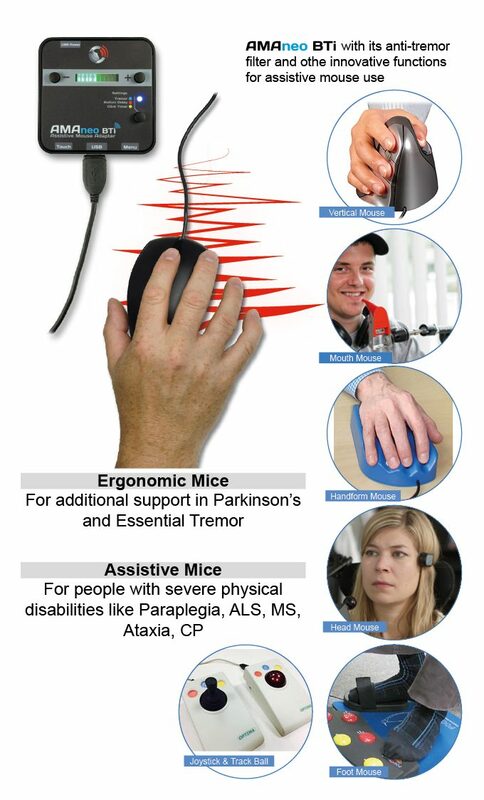 The AMAneo Assistive Mouse Adapter from CSS helps people with hand tremor to use the mouse on the computer much easier or even making it possible at all. This adapter filters electronically the trembling of hand, which can also be very strong, so that the mouse pointer on the display moves smoothly anyway. With tablets, the control by touchscreen is replaced by a normal mouse or a special assistive mouse like e. g. a head or chin control. The device is simply plugged in between mouse and PC or notebook or connected via Bluetooth with the tablet. That is all it takes to make mouse control and operation much easier. It works with any mouse and any operating system without any software installation. It will be also possible to control iPads® by assistive mice with the new version AMAneo BTi. This opens up a new world for many people with disabilities. The intensity of the tremor filter can be adjusted easily. There is also a click delay (the mouse pointer stops at the mouse click). An automatic click function is also integrated. The essential features are connectivity for USB or Bluetooth, adjustable tremor filter, adjustable click delay and an adjustable auto-click. There are connections for external push-buttons for the left and right mouse button. This world first makes it easier for people with tremors to participate in daily life. World first: AMAneo® BTi enables disabled people to operate iPad & iPhone by mouse. Until now, it was not possible for you to control your iPhone or iPad with a mouse or a mouse replacement. 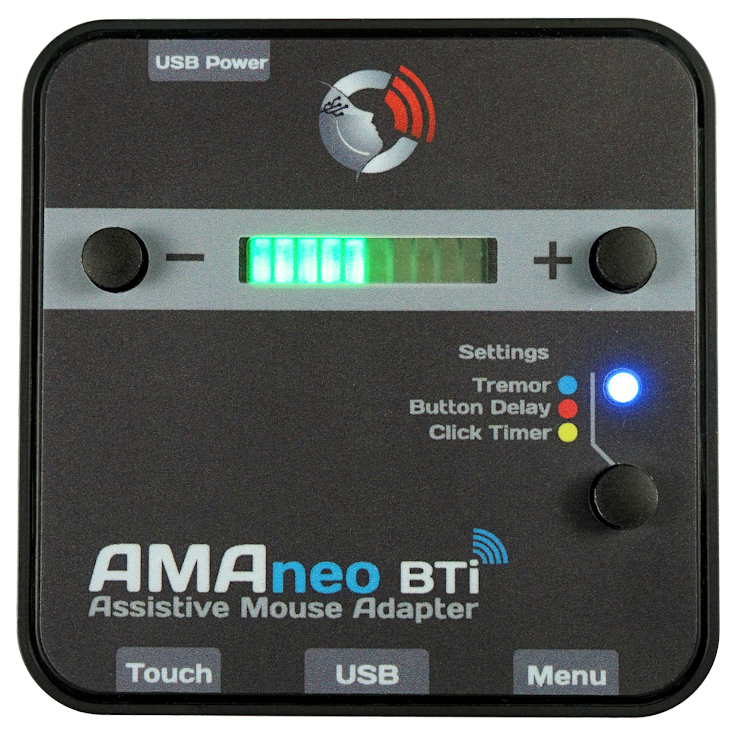 With AMAneo BTi you can now operate your iOS device with any assistive or ergonomic mouse. It works with any iPhone 5s or higher, iPad 4 or higher, iPad mini or higher, without any additional app. 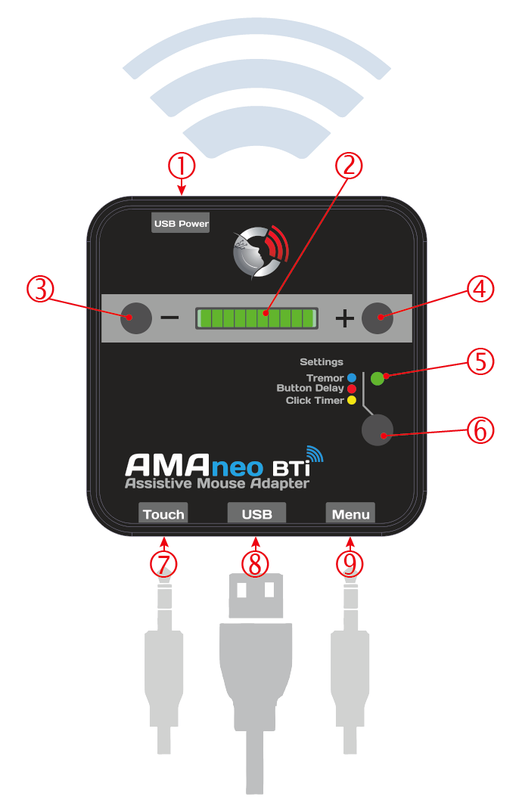 Simply connect AMAneo BTi by Bluetooth: the touch pointer will appear on the display. Millions of people suffer from a severe hand tremor, e.g. caused by Parkinson’s disease. The severe tremor makes it more or less impossible to operate iPad or iPhone. AMAneo BTi with its innovative anti-tremor filter and additional functions for assistive mouse use will enable many people to use iPad and iPhone for the first time. Until now, people with severe physical disabilities can only operate iPad & iPhone by switch control of the iOS. This is relatively uncomfortable, as you have to jump from function to function and can never “click” something directly. 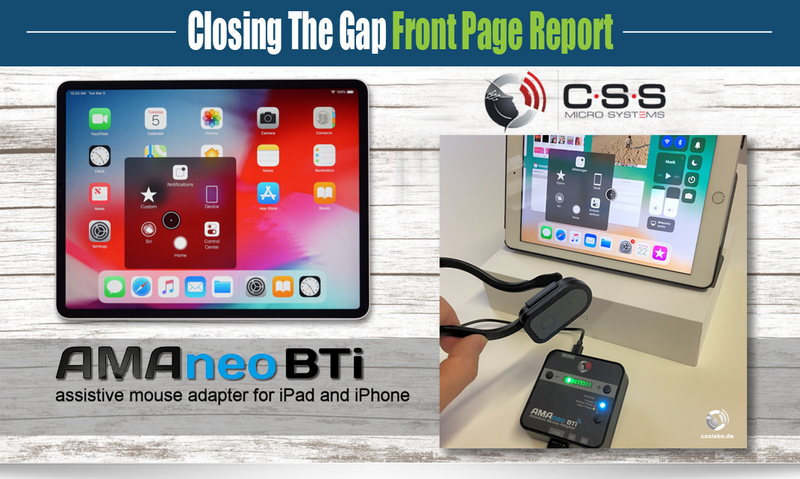 With AMAneo BTi it is possible for the first time to operate iPad or iPhone directly with an assistive mouse (head mouse, joystick mouse, foot mouse, mouth mouse, finger mouse etc.). Fully integrated AssistiveTouch menu. This makes it possible to use all the functionality of the hardware buttons on the iPhone or iPad. The CSS MicroSystems GmbH based in Weinsberg stands for over 30 years of experience in development, production and sales of electronic aids for people with disabilities. The aim is to put state-of-the-art technology into the service of people with special needs. The focus is on products for environmental control, assistive call activation for hospital and care, as well as assistive computer access. CSS as a manufacturer develops high-quality components and systems with a team of specialists and produces with its own production in Germany. The development focuses on the needs of users and facilities such as hospitals and nursing homes. Feedback and customer requests form the basis for new, but also for the further development of proven products. CSS maintains very close business relationships with specialist dealers, distributors and organizations in Germany and worldwide.